Corn Beef. 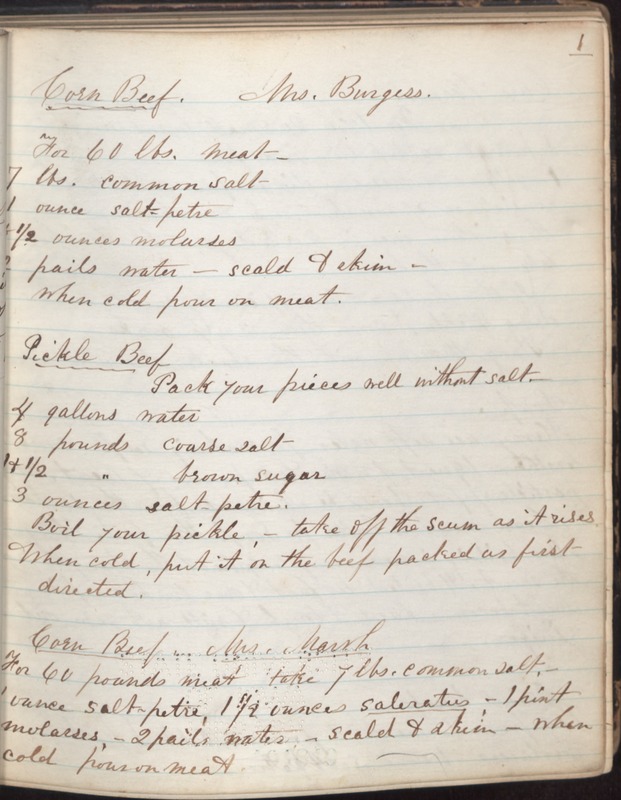 Mrs. Burgess For 60 lbs Meat _ 7 lbs common salt 1 ounce saltpetre [illegible] 1/2 ounces molasses 2 pails water - scald & skim when cold pour on meat Pickle Beef Pack your pieces well without salt. 4 gallons water 8 pounds coarse salt 1 & 1/2 " brown sugar 3 ounces saltpetre. Boil your pickle, - take off the scum as it rises. When cold, put it on the beef packed as first directed. Corn Beef _ Mrs Marsh For 60 pounds meat, take 7 lbs common salt, - 1 ounce salt-petre, 1 1/2 ounces saleratus - 1 pint molasses, - 2 pails water. Scald & skim _ when cold pour on meat.